It is a bold request that the mother of the sons of Zebedee made of Jesus: asking for places of honor for her sons within the kingdom of God. Amazingly, Jesus did not rebuke her or her sons. Instead, Jesus put forth his own question: “Are you able to drink the cup that I am to drink?” Jesus knew the cup he was given by his Father meant he would suffer and die for the sake of God’s people. The cup he is to drink is the cup of God’s salvation, a cup that comes with a cost. 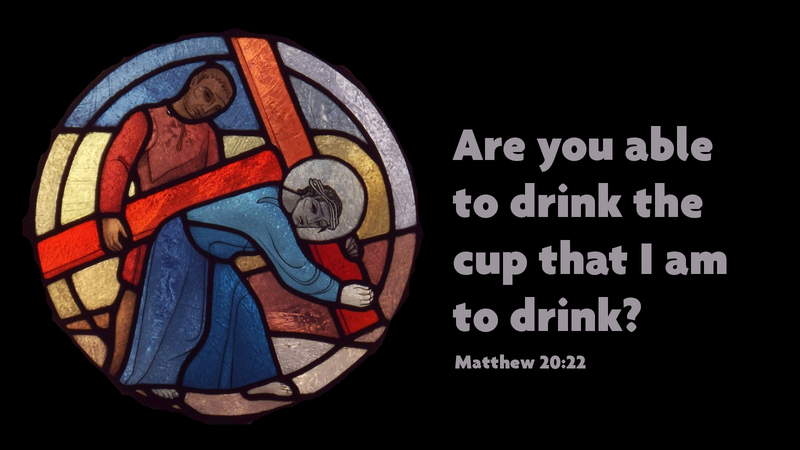 Jesus asks, “Can you drink the cup?” In faith, we answer, Yes, but how? Jesus gives clear instructions: deny yourself and take up your cross. Drinking the cup of Christ means suffering with him, serving others, enduring hardship, and having faith that God will equip us to do these things. It means putting away our selfish ambitions and extending our hands to meet the needs of the poor, hungry, and lost. Drinking the cup means loving God and loving neighbor first, offering our lives to Christ in order to gain life in God’s kingdom. Can you drink the cup? With God’s help, yes, you can. Prayer: O Lord, give us the strength and the will to drink your cup, that we may follow Jesus’ example of love and service for the sake of others. Amen. Just by reading the first couple of sentences, I could tell it was your writing, blessings and peace be with you. It is a mixed cup that we must share with Christ. One, is to be more like him and serve others ahead of ourselves, Two, is to accept the persecution from others because of our faith in Christ. To see how the Christians all over the world are suffering in His name. To feel that in our hearts. Knowing that if we allow our government, who took Christian prayer out of our schools, is eager to allow Islamic teachings in our school all for the sake of diversity. May God continue to bless the church today as we, His chosen, continue His work here until the day he takes us home.